The timing of posting this recipe may have worked out well, given the snow Winter Storm Jonas dumped on the east coast this past weekend. It will warm you up from the cold and leave your belly satisfied! Without further ado, here is my Chicken and Dumplings recipe. Cut the rotisserie into bite size chunks. In a large pot, heat EVOO over medium-high heat. 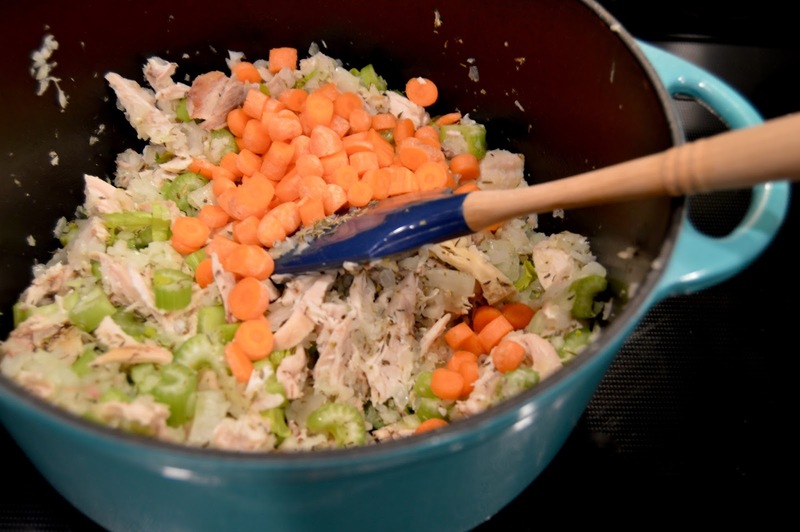 Add carrots, celery, onion, herbs, and garlic to the pot and cook until they begin to soften. Add the bay leaves, chicken bouillon cubes, onion powder, garlic powder, chicken pieces, and 10 cups of water. Reduce heat to medium low and let simmer for 15-20 minutes to allow flavors to blend; remove the bay leaves. 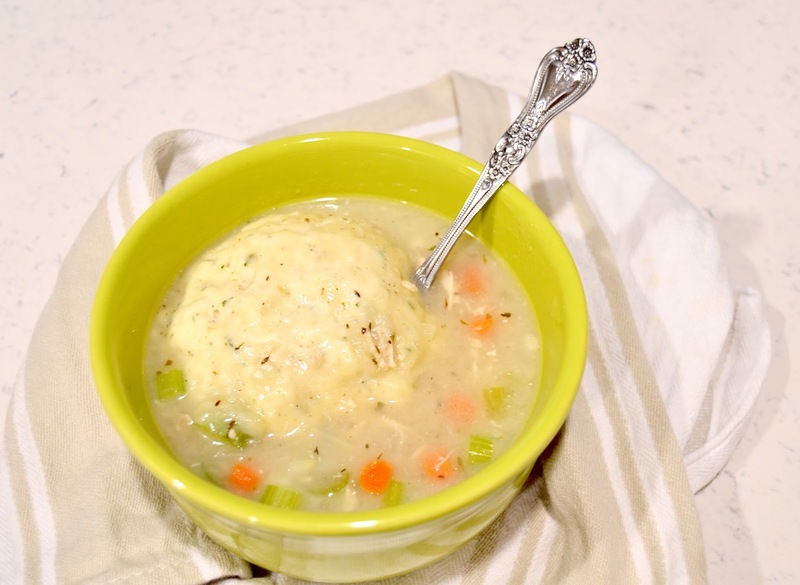 In a small bowl, whisk together ¾ of a cup of flour and 1½ cups of the broth until there are no lumps. Pour this mixture back into the broth, continually stirring until thickened, about 5-10 minutes. Combine remaining 2 cups of flour, baking powder, baking soda, salt, pepper and parsley in a medium bowl, stirring until well incorporated. Whisk in the butter and buttermilk. Reduce heat to low. Divide dough into 8 dough balls. 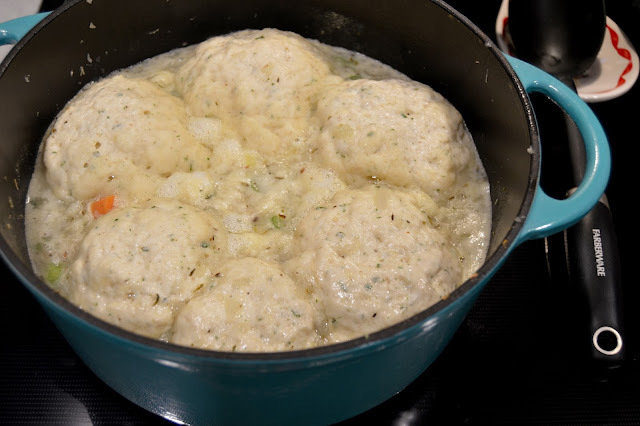 Using a large spoon, carefully drop the dumplings on top of the broth. 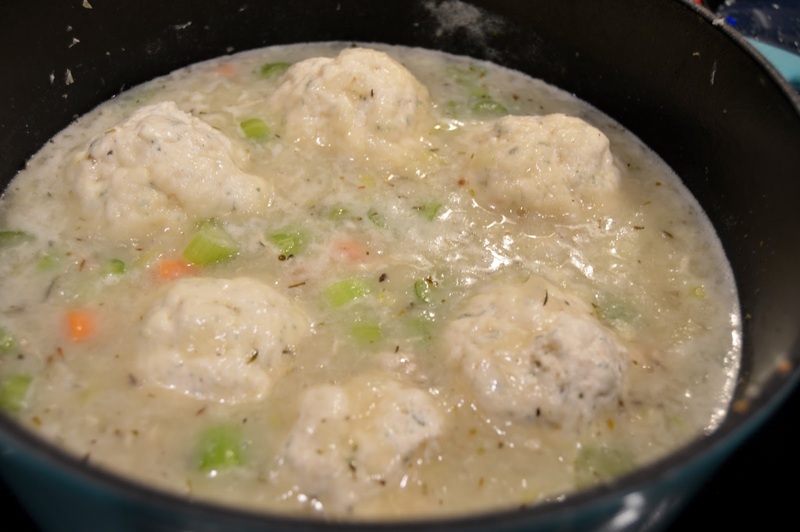 Cover and let simmer until dumplings are firm, about 12 minutes. Using a ladle, spoon out one dumpling per bowl and cover with the broth. Enjoy! NOTE: You can save the bones from the rotisserie to make your own broth for the next time you need it!